The wisdom of Kabbalah is a teaching about the harmony that exists in the world, nature, the Creator, and the work humanity must perform to achieve that harmony. Although this process is predetermined by nature, its realization depends on us. Professor Ervin Laszlo was a Nobel Peace Prize nominee in 2004 and 2005. He is a doctor of philosophy at Sorbonne University, an honorary doctor at universities in the U.S., Canada, Finland and Hungary, a professor of philosophy, systems science and futurological research. He presently resides in Tuscany, Western Italy, and lectures throughout the world. Professor Laszlo is the founder and president of the Club of Budapest, founder and director of the General Evolution Research Group, president of the Private University for Economics and Ethics of Vienna, member of The World Academy of Arts and Sciences, member of The International Academy of Philosophy and Science, member of the International Medici Academy, and editor of the international journal, World Futures: The Journal of General Evolution. Professor Laszlo is the author of 47 books, translated into 20 languages, and the editor of 30 books, including four volumes of the World Encyclopedia of Peace. 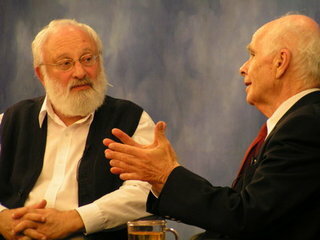 In April of 2006, Ervin Laszlo was an honorary guest at the Ashlag Research Institute in Israel, headed by Professor Michael Laitman. During this visit, the two scientists, and co-authors of the book From Chaos to Harmony: The Solution to the Global Crisis According to the Wisdom of Kabbalah, held numerous discussions regarding the future of the world and the development of an effective solution to the global crisis. A question I received: Why do you “feminize” desires? Why do you say Ratzonot Egoistiyot (which is the feminine form of saying “egoistic desires” in Hebrew), when everyone knows that “desire” (Ratzon) in Hebrew is masculine? My Answer: Even though desire (Ratzon) is grammatically masculine, it is feminine in function and actualization. In Hebrew, Nukva (female), is a hollow which becomes filled by the Light, and Zachar (male) is he who fulfills this hollow by performing the act of filling, called Zivug (coition). A question I received: Why do you reveal all of this secret knowledge to gentiles? A mutual guarantee (Arvut) among a single nation is capable of initiating the correction of the whole world. Likewise, all nations are incapable of carrying out this correction simultaneously. It is as the sages said: The Creator offered the Torah to all nations (through Abraham in ancient Babylon), but they declined the offer, because the magnitude of their egoism, their self-love, made it impossible for them to accept it. Thus, Abraham created a group of Babylonians (people with desires for spirituality) who were ready and willing to renounce their egoism, and this group became known as the nation of Israel. The only difference between the Babylonians in this group and other Babylonians of that era was that Abraham’s group accepted upon themselves the method of rising above their egoism. Moreover, Abraham, who was a Babylonian priest, became the first Kabbalist. Therefore, by accepting upon themselves the required guarantee (Arvut), the nation of Israel was obligated to be the chosen people among all other nations. In any case, the correction of the whole world will take place when all nations unite in their aspiration toward the Creator, and the Creator will reveal Himself to all nations. It is as it is written: “The earth will be filled with the knowledge of the Creator, and all of the nations will flock to Him.” As such, the nation of Israel holds the responsibility for leading humanity to love for thy neighbor, and ultimately, to the goal of creation, which is to merge with the Creator.